The Cerebellum: Disorders and Treatment, Volume 155 updates readers on the latest and clinically relevant advances in the study of cerebellar diseases in children and adults. It is organized into sections detailing: (1) Disorders (starting from the fetal cerebellum, to adult cerebellum) encountered during daily practice, and (2) Therapy (including insights into innovative drug and rehabilitative approaches). 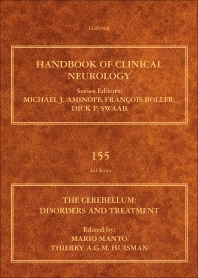 The book's innovative structure discusses cerebellar disorders in children and adults as a continuum, with its companion volume, The Cerebellum: From Embryology to Diagnostic Investigations detailing embryology, anatomy, function and diagnostic investigations and neuroimaging, including conventional sequences, diffusion tensor imaging, functional MRI, and connectivity studies. Dr. Mario Manto is a Neurologist at the Université Libre de Bruxelles (Belgium) with more than 20 years of experience in clinical neurology, particularly cerebellar ataxia. He is a Professor of Neuroanatomy at the University of Mons (Belgium) and Researcher at the FNRS (Belgium). He has been appointed Head of the Department of Neurology of the Centre Hospitalier Universitaire (CHU) de Charleroi (Belgium). The focus of his career for more than 20 years has been the study of cerebellar disorders, from a clinical and basic science point of view. He published more than 160 peer reviewed scientific articles and 15 book chapters on cerebellar topics and he is the editor of 6 books on cerebellar disorders. He is the Founding Editor and Editor in chief of two scientific journals: The Cerebellum and Cerebellum & Ataxias. He is Deputy Editor of the Journal of Neuroengineering and Rehabilitation and a Member of Faculty 1000. He has received many grants from several foundations including the NIH, European Commission, and the Fonds National de la Recherche Scientifique of Belgium.